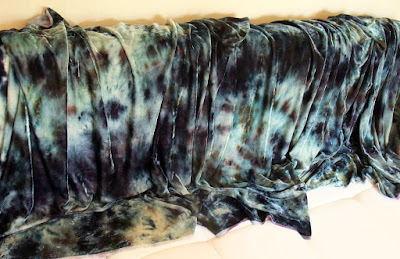 Yesterday I dyed the biggest piece of fabric I have ever dyed with this method. I couldn't do big work before because I didn't have adequate containers. Now I have some nice big dye vats so I managed to do this 4.5 yard piece. I still had room enough to fit another yard in if I wanted too! I am quite happy about this. I can see so many more possibilities now.